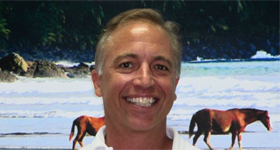 Originally from Ocean City, Maryland, Casey moved to Costa Rica in 1995 and has lived here ever since. Casey began his Real Estate career in Costa Rica as an Investment Adviser and quickly discovered that he greatly enjoyed helping investors find the best price for land and homes that perfectly suited their needs. During this time, Casey quickly realized that there was a major demand in the market for honesty and hard work in the Costa Rica real estate market. He co-founded Costa Rica Real Estate Service with those principles in mind. He is very proud that his company has achieved a stellar track record of keeping real estate investors from across the globe satisfied with detailed due diligence that protects them through the purchase process and beyond. Simply put, Casey’s vision for real estate opportunities in Costa Rica is second to none. He provides sound practical advice and consistently positions his clients so well for financial gain, that they keep coming back for more. Contacting other agents is fine, but if you are an investor looking for great deals in a recovering Costa Rica real estate market, then contacting Casey should be on your short list. 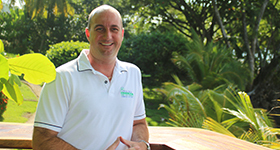 Born in Annapolis Maryland, Paul came to Costa Rica in 2000 after selling his successful business in the USA. He immediately fell in love with paradise and decided to stay. Having grown up on the coast in Maryland, the Mediterranean Coast in Spain, and also Puerto Rico, he immediately recognized the investment opportunity here in Playa Dominical and proceeded to invest and build. 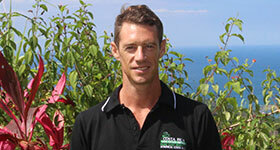 Paul has personally watched the evolution of the Southern Zone and has an intimate knowledge of the region’s history. He has seen first hand why people win and why they fail. Paul is a true local and is an invaluable resource on where to find hidden opportunities and how to avoid potential pitfalls. 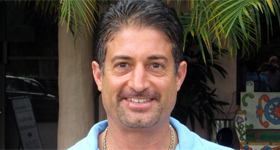 No matter what your goal is: moving to Costa Rica for retirement, purchasing quality investments for your portfolio or helping you to get a quality “Eco friendly” development done, Paul Dorr treats all of his clients’ deals as if he were making the investment for himself and will guide your monies to always maximize your investment! Clinton Stephenson is a 1998 graduate of the University of Nebraska with a Bachelors in Business Administration and minor in Political Science. He also also attained a 1997 graduate of the Oxford University International Business Program. Clinton’s extensive Costa Rica work experience includes several management positions with the Punta Dominical Development Group and it’s partners from 2002 thru 2011. 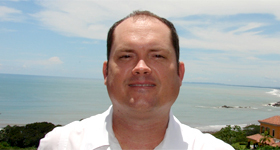 In July of 2012, he started working with Costa Rica Real Estate Service as a Senior Investment Advisor. Clinton is fluent in Spanish and his responsibilities included: surveying and segregation, building infrastructure (roads, water/sewer systems, electrical systems), construction supervision, community relations and company liaison with buyers of properties in the Punta Dominical communities. Clinton has served on the boards of the Dominicalito Elementary School, the local police department, and Una Mano Amiga Foundation. In 2012 Clinton owned and operated La Parcela Restaurant until it was purchased by a third party. With his family, Clinton also owns a vacation rental home and other properties in Dominical and the southern zone. Clinton consistently lands high end deals for an upscale clientele and is also our “go to” guy in the downtown San Jose area. His vacation rental home in Dominical is consistently booked solid and he is the perfect person to look to for guidance when it comes to income producing vacation rental properties. Clinton was granted residency in Costa Rica in 2004 and is now in the process of earning citizenship. 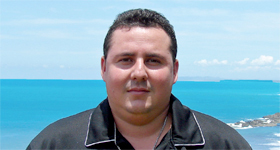 He is a genuine Costa Rica real estate pro and has an impeccable track record across the board. Keith Schenkel is an absolutely integral part of our team that will go the extra mile for his clients – whether it is a showcase home by the beach or driving up rough roads to a large land parcel in a remote part of the country – he is always reliable and can be counted on to serve his clients with everything he’s got. Keith puts the “Service” in Costa Rica Real Estate Service and everyone who is fortunate enough to work with him often rave about his devotion to fulfilling their needs. Keith is from the greater Washington D.C. metropolitan area with a Bachelors Degree in Civil Engineering from the University of Maryland plus eight years of experience as a sales engineer. Later, he earned his real estate license in Maryland and performed a dual role as an agent and sales engineer. After spending several vacations traveling around Costa Rica and falling in love with the country, he decided to relocate permanently in 2003. Upon his arrival, he worked in the Costa Rican hotel industry for two years and then joined the team at Costa Rica Real Estate Service in December 2005. As a Senior Investment Advisor, bilingual in English and Spanish, and as a permanent resident of Costa Rica, he is dedicated to providing clients with an excellent and professional level of service. He is thrilled at the opportunity to live in the spectacular coastal area of Dominical and to assist a diverse group of people with their real estate investments needs in Costa Rica. Keith’s superior level of service and unique insight into the region, makes him an invaluable resource to our worldwide client base. 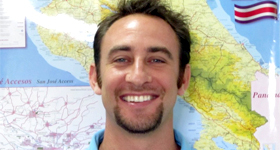 Jordan Loesser is originally from Vero Beach, Florida and has spent over 10 years living in Costa Rica. He has paid his dues here and knows the country like the back of his hand. He will take you anywhere you want to go and is happy to share his intimate knowledge of the country which will provide you the insight you need to make a sound investment suitable for your personal goals. After finishing his Bachelor’s degree in Florida, Jordan immersed himself in the vibrant culture and geography that Costa Rica has to offer. Spending an abundance of time traveling the country’s rural and coastal landscapes, Jordan has developed contacts in many areas as well as sharpened his Spanish speaking skills to a fluent level. If Jordan is showing you around, you can rest assured that you are in very good hands. If you want to know where the secret surf spots are, where the wildest rainforest is, where to find private waterfalls, where to find the best sunset views, or where the most “tranquillo” locations are – Jordan’s passion in the amazing elements of Costa Rica and his vast knowledge of the real estate market are unparalleled. For those who wish to immerse themselves in the pure Costa Rica experience, Jordan is the perfect guide to finding the ideal Costa Rica real estate location for you. 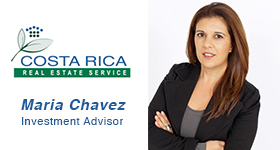 Maria Chavez is the latest addition to the CRRES team of investment advisors and she brings a wealth of experience with her. Maria is a Certified Real Estate Agent with the Costa Rican Chamber of Real Estate and attained a Real Estate License with the Department of Commerce in Minnesota, USA. A native Costa Rican, she was born and raised in Zarcero in the province of Alajuela. After finishing her studies in International Sales / Hotel & Tourism in San Jose, Costa Rica, and implementing that training with over five years of sales at the Sol Melia Hotels & Resorts, she moved to the United States to continue her career abroad. Maria moved to Sacramento, CA where she spent 7 years as a Sales Coordinator / Brand Manager at the corporate headquarters of Java City, a coffee chain with over 2,500 locations across the United States. Afterward, she relocated to Minneapolis, MN where she managed local accounts for the McLane Company, a highly successful $28 billion supply chain services company based out of Temple, TX. After two years, she seamlessly transitioned to the real estate industry where she worked with RE/MAX Results in Saint Paul, MN. During this time she attained her real estate license, became a member of the Minneapolis Association of Real Estate Agents and interfaced directly with buyers, marketing executives, banks, loan officers and title companies. Now Maria is bringing her vast international sales experience back home to Costa Rica. Maria has a warm demeanor and is a highly qualified agent that is fluent in both English and Spanish. She is the perfect addition to our team and has provided the level of service that we demand for all of our clients. Her unique set of skills is combined with local knowledge that gives her an inside edge and backed by a successful sales & management track record in the United States. When you work with Maria, you can feel assured that you will receive professional and competent representation with all of your real estate investment needs in Costa Rica. A native of Sun Valley, Idaho Trevor spent most his time in the northwest from Idaho to California. A graduate of the University of Nevada, Reno, Trevor has a Bachelor’s degree in Business Administration with a focus on International Business and minor degrees in both Spanish and Marketing. Prior to moving to Costa Rica, Trevor had his Sales Agent License in the state of Idaho. Trevor is an outdoor enthusiast, dedicated surfer, and Real Estate Agent with a wealth of local knowledge and commitment to professionalism. Recognized as an honest and hardworking individual, Trevor strives to ensure you are comfortable and confident in your investment decisions. His contacts and resources guarantee that you will be shown the best options on the market and he will personally guide you through the entire Real Estate process. There is no investment too big, or too small. Laura Jara is a native Costa Rican and grew up in the city of San Isidro de Perez Zeledon. She is a true local and knows the “ins and outs” on how things work in this country. She graduated from Universidad Latina de Costa Rica and shortly after managed an import / export business for 3 years. Later, she lived in the United States where she became fluent in English. After returning home to Costa Rica, she worked with a developer in the area and personally managed over 300 hectares of property. Here she developed problem solving strategies and whenever obstacles would appear, she would put together and manage a team of local contacts and resources to get the job done. Later she founded her own project management company where she utilized her intimate knowledge of property development in the Southern Zone of Costa Rica. She has worked with clients from Ojochal and up the coast through Dominical. On the personal side, we don’t know anyone who is a greater animal lover than Laura. She is a natural fit with the CRRES team and you will gain valuable insight into the country when working with Laura Jara. The foundation of our continued success begins and ends with how we treat our customers – both before and after the sales process. When you work with our team, you will receive personal attention that goes far beyond buying and selling properties. We highly recommend that you visit our Google+ page to get a true sense of what we are all about. We realize that purchasing property in a foreign country can be intimidating, so we will walk you through every step of the process, informing you about the logistics, what you can expect to find in each location, and the potential benefits or risks involved with each transaction. Our goal is to provide you the type of trusted and unbiased information that you can base a life changing decision on. An obvious example would be a retiree with health concerns. We’re not going to recommend real estate that doesn’t have quick access to a health care facility capable of treating their specific medical need. Each person will have a unique set of requirements and you can count our intimate knowledge of Costa Rica to ensure that you are presented a tailored set of options that are ideal for you. We’re going to provide you the full picture, even if the information disqualifies a property that you may have been seriously considering. Ultimately the decision is yours, but we believe that you will find our advice will be an invaluable resource. We leave the hard pressure sales tactics to the others because we’re in this for the long haul. Whether you are looking for a million dollar property or just have general questions about Costa Rica, reach out to us and meet our team. You will see first hand why we have developed such long lasting relationships with our clients.